Knowing what to eat with diabetes can be frustrating, but it’s the most important way to manage the disease. It’s also the area where people give up the fastest, but with Ultimate Diabetes Meal Planner you will never have to ask “What’s for dinner?” again. Ultimate Diabetes Meal Planner includes weekly plans for breakfast, lunch, dinner, and snacks, along with detailed recipes that make using the 16-week meal plan easy. The overall calorie count—based on 1500, 1800, 2000, 2200, or 2500 daily calories—lets you choose the right diet, whether you’re looking for weight loss or just healthy living. Fitness and nutrition expert Jaynie Higgins takes the guesswork out of diabetes meal planning and puts everything you need in one amazing collection. With 16 weeks of meal plans and over 300 amazing recipes, the Ultimate Diabetes Meal Planner will guide you toward a healthy, diabetes-friendly lifestyle. You’ll find weeks of personalized meal plans in four different calorie levels; shopping lists; and nutritious, tasty recipes. Take the mystery out of food and diabetes in just 4 easy steps! I recently had an elevation in my blood sugars for the first time. It is a scary thing when you don't know what or how much you should be eating. Or to what extent diabetes will effect your life. I immediately turned to The Unlitmate Diabetes Meal Planner as my guide. Knowing that there was a menu for every day of the year was such a comfort. With everything else I needed to learn about this disease, not having to worry if I was eating the correct food and portions gave me such peace of mind. I started feeling better from the first day. The food is delicious and the recipes are easy to prepare. There is such variety you don't get bored. By adding exercise to my lifestyle and sticking to my meal plans I am able to keep my sugars under control. I would highly recommend this book. The menus changing with the four seasons allows you to take advantage of fresh fruits and vegetables year round. Offering the meal plans in calorie counts 1500, 1800, 2000, 2200 makes them suitable for anyone. Thank you Jaynie Higgins and David Groetzinger for doing the hard work with care and compassion. Your book is sincerely appreciated! Although I have not been diagnosed yet...my sugar levels and symptoms point to type 2. As soon as I found that my numbers were elevated I started using The Ulitimate Diabetes Meal Planner. With so much to learn it is a comfort to me that I can choose a menu according to my calorie intake and trust that I am eating the appropriate food. Not only for diabetes safety, but also for good nutrition. I felt better from the first day. I am in hopes that I will be able to control my sugars with diet and exercise. No matter my outcome, I will continue to use this book as a guide for a healthy lifestyle. I love it! The food is varied and delicious. The recipes are easy to make with few ingredients so that cost is kept down. Thank you Jaynie Higgins and David Groetzinger for your compassion and knowledge. You are sincerely appreciated! I just recently discovered that my glucose levels are high. I am soon to have blood tests to determine my diagnosies. Diabetes is not a disease I considered that I would have to deal with. I am worried and have many questions and concerns. One thing I don't have to worry about is if I am eating properly. And right now that brings me great comfort. 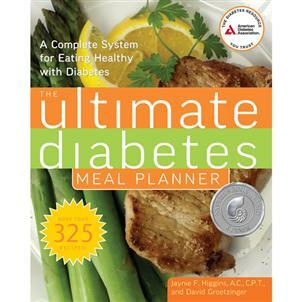 The Ultimate Diabetes Meal Planner has recipes for every day of the year which change with the 4 seasons. (Spring, Summer, Winter and Fall) As if that isn't enough you also have the choice of meal plans for 1500, 1800, 2000, 2200 calories per day so you can choose what best suits your needs. There are also grocery lists included and all I have to do is check off the items I need and take the list with me to the store. I don't have to stress and hope that I am making the right decisons for my health. The work has been done for me. The food is delicious and the meals are thoughtfully planned out and are easy to prepare. Exchange and nutritional values are included with every recipe. Beginning this lifestyle is confusing and complicated enough. Thank you Jaynie Higgins and David Groetzinger for making this process much easier. Your knowledge and compassion are sincerely appreciated. I wanted to read the reviews, not write a review on something I haven't even seen yet.